Macron has said restoring Notre Dame is “undoubtedly part of the French destiny and the project we’ll have for the coming years.” Various donors have already pledged over $300 million for the reconstruction. Hey Buddy!, I found this information for you: "Putin Offers to Send Russian Experts to Restore Notre Dame Cathedral". 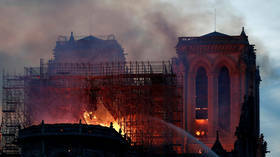 Here is the website link: https://russophile.org/putin-offers-to-send-russian-experts-to-restore-notre-dame-cathedral/. Thank you.